MP Vyapam has Conducted MP Vyapam Patwari Examination 2017 In two Shifts. Exam Was Conducted In Two Shifts. About 11-12 Lakhs Students are taking Part In this Examination. 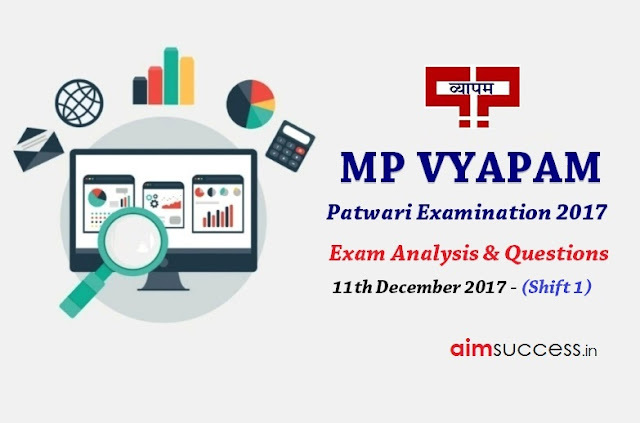 In this Post we are sharing the MP Patwari Exam Analysis 2017 - 11th Dec 2017 (Shift 1) & Expected Cut Off. हाथ कंगन को आरसी क्या …? वर्णमाला कि सबसे छोटी इकाई कौन सी होती है ? निश्छल में कौन सी संधि है ? 2 गुणनफल का यौग 8000 है तो संख्या क्या है? 5x²-4x+7 =0 x kaa maan kya hai. Which government had the Ashok Mehta Committee? What is the rate of India in the Human Development Index? What is the hardware, software that connects to the user?